Madcap Mine is a cave-themed level in the Wild West World of DK: King of Swing. It is one of the four levels in the world that must be completed to battle Fire Necky, the world's boss. 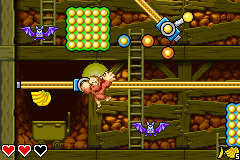 Like the previous cave level, Contraption Cave, it features levers, which can be pulled to move Donkey Kong (or Diddy Kong in Diddy mode) along long, yellow bars or to allow him to manipulate peg boards. It is also the first level to feature conveyor belts and crates. A large number of Flipflaps also appear here, along with a few Neeks. As most levels, it features both a Crystal Coconut and a DK Coin, which is silver. Mine Carts can be seen in the level's background. In the first part of the level, the player can find a lever above a pair of pegs. If they pull it down repeatedly, it moves along the yellow bar it is connected to, which has several bananas lining it. Two large peg boards are above the end of the bar with a Flipflap to the left of them and another lever ahead of them. The lever can move the player along a yellow bar to reach a few bananas and a blue peg board that has a few single pegs near it. A lever on a slanted bar is by the pegs, which the player can use to travel upwards. A Flipflap gets in the player's way as they travel. The next peg board immediately after the end of this bar is followed by another lever on a bar. Without hitting into the moving Flipflap crossing back and forth on the two sides of the object, the player can pull themselves to a ledge that leads to the next area with the lever. In this area, there are a few sets of conveyor belts that pull the player downwards. Neeks walk on them as if they were on a treadmill. A crate is at the bottom of the area with some spikes under it. When the crate is destroyed, a large Banana Bunch is revealed. Two more crates are at the top of the belt, and a Neek blocks the player's path between them. Both crates contain normal Banana Bunches. There is a small set of conveyor belts above here, which the player can jump from to reach a ledge that leads to the third section. Donkey Kong pulls a lever in order to make a few platforms appear. Here, there are levers that can alter the Kong's surroundings. The first lever is at the beginning of the area above two single pegs. When it is pulled a few times, three blue peg boards appear behind some bananas, disappearing after a short time. They can be used to reach some more peg boards, which have a green lever above them. Three green peg boards appear for a limited time above when it is pulled to aid the hero in reaching some solid peg boards. A barrel with a DK Coin in it is on one of these peg boards, which can be broken if the player pulls the previous lever to make a fourth peg board appear above it. There is a third lever ahead of here, and when it is pulled, three red peg boards descend for the player to use. 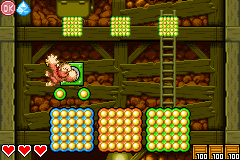 When the lever is not being pulled, they begin to move upwards again, so the player can hold onto them as they rise to reach a ledge with an exit sign on it. A ledge nearby supports a Bonus Barrel, which leads to a Bonus Level where the player must climb up several peg boards and collect all of the bananas within the twenty second time limit to make a Crystal Coconut appear at the top of the room. Once the the player exits the bonus level, they can land by the aforementioned exit sign to complete the level. This page was last edited on April 5, 2019, at 12:47.